Last weekend I drove up to St. Augustine to visit a good friend of mine Chris. I didn’t know this until I got there but St. Augustine is the oldest city in the United States. It was founded back in 1565. I had been to St Augustine once when I was younger but I barely remembered a thing. I was excited to see Chris and explore the city. 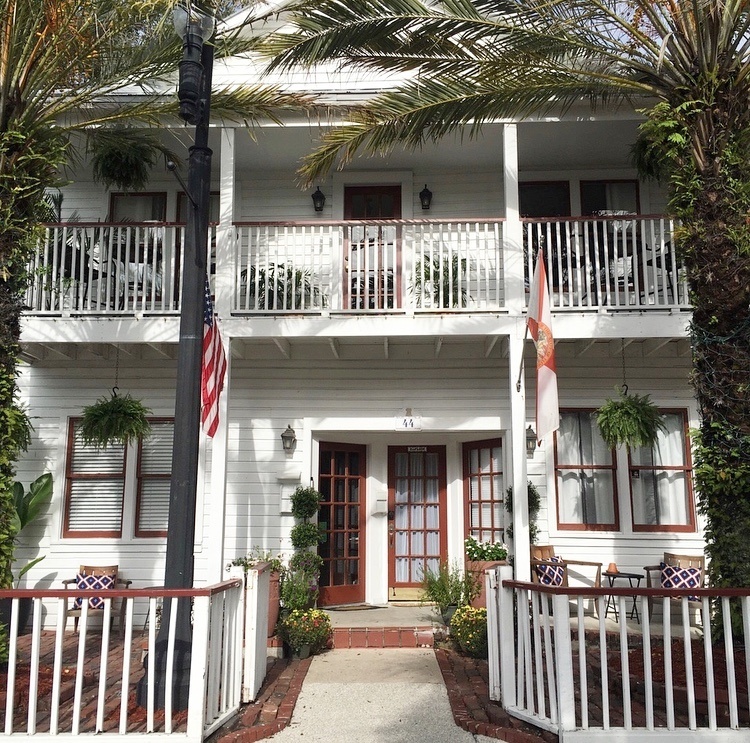 We ended up staying at a Bed & Breakfast, the 44 Spanish Street Inn. I had never stayed at a Bed & Breakfast before so this was my first time. I was really excited. Chris knew the owners so they accommodated us in one of their best suites. The suite was absolutely adorable. It was the front room on the first floor. When you first walked in there was a sitting area next to an armoire with a full length mirror. 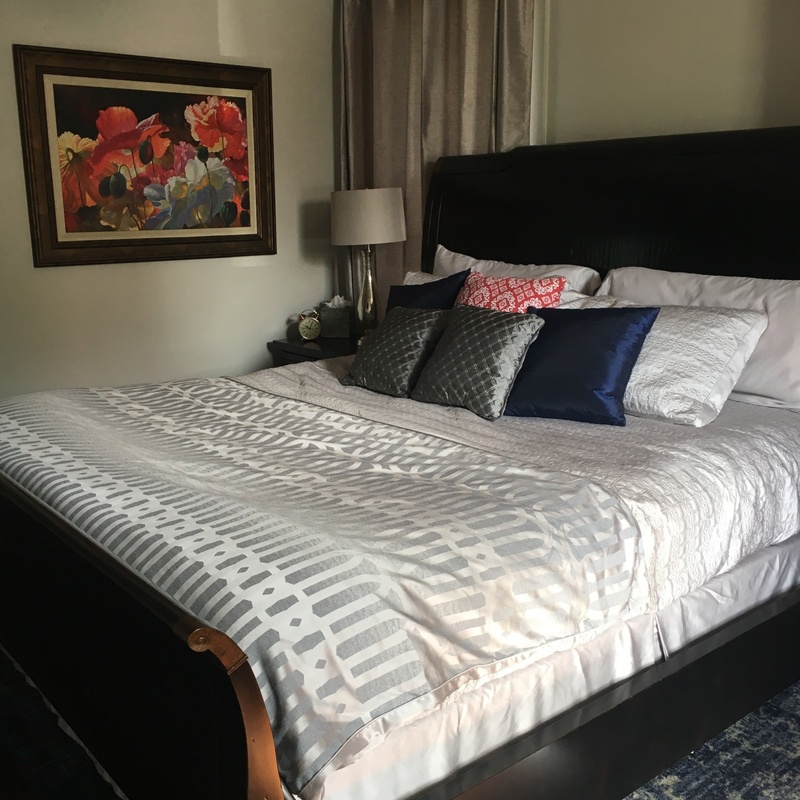 Next to the armoire was a king sized sleigh bed with two night stands and a flat screen tv in front. The bathroom was spectacular. The shower had this modern overhead shower head with a wand attached and all sorts of settings in the middle. The vanity was dark espresso with a vessel sink and a mirror that had a power button in the center. When you hit the power button the mirror lit up from all sides. For breakfast on Saturday I had orange juice with a bowl of fruit and a vegetable quiche. This was my first time have a quiche and it did not disappoint. Since I’m a pescatarian I thought it was great they had a non meat option for breakfast. The owners Brian and Emery where out and about and always hospitable. Sheryl our server was so sweet and even the Chef Mary came out and introduced herself to see how everything was. I’ve never experience such great service. 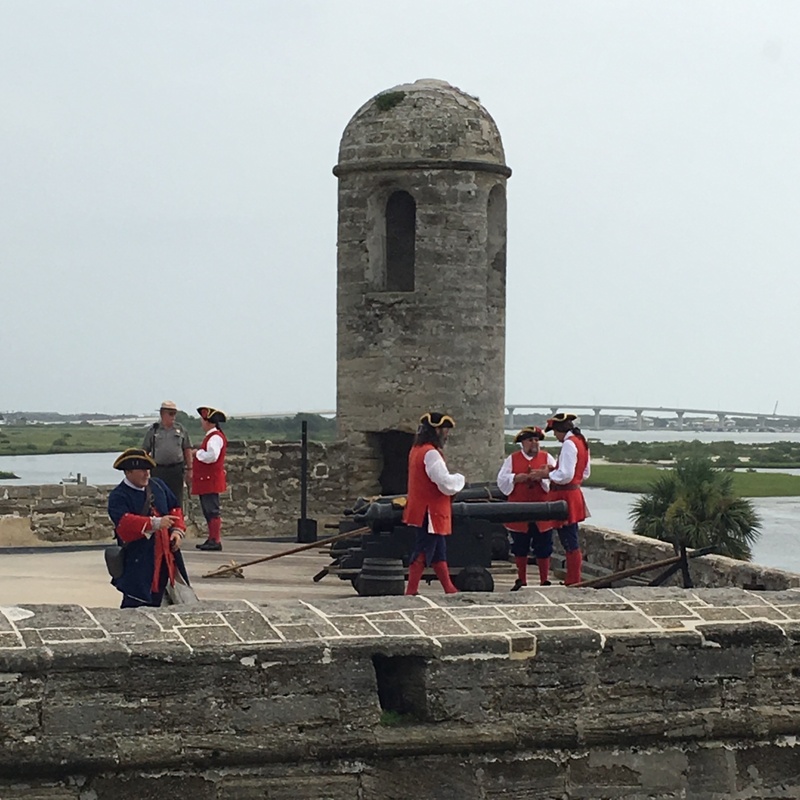 The Castillo De San Marcos is the oldest masonry fort in the continental United States. The fort was huge, bigger than I had imagined. We were able to explore the soldiers quarters, dungeons, and store rooms for their supplies. While we were there we were able to see them shoot off a canon. Local volunteers dressed in the uniforms from back then and did a drum roll and marched from the bottom up to the top and reenacted the steps it took the soldiers to load and shoot a canon. I usually opt for the local trolley tour as its a great way to learn the history of the city you are visiting. You also get the lay of the land as far as where everything is. Instead of taking the traditional trolley tour we decided to do a personal golf cart tour called “Explore Tours & Pickups.” The golf cart could sit up to nine people but Chris and I had it to ourselves. It was perfect. We didn’t just get a tour of the city we got an educational tour where we learned the history of how St. Augustine was built. After the tour was over we had the tour guide drop us off at the fountain of youth. The fountain of youth an is archaeological park spanning over 15 acres. You can learn about the first Spanish settlers and the native Timucuans that lived there. Chris and I explored the different buildings and dwellings they had on site. Also, I sampled the water from the natural spring known as Ponce De Leon’s legendary “Fountain of Youth”. Now I’m still waiting for the water to kick in lol but honestly it wasn’t all that bad. It tasted like spring water, the only draw back was that it smelled. As we were leaving the fountain of youth I recognized the street right outside the entrance from a website. It was called Magnolia Avenue. The street is lined with oaks with the air plant Spanish moss hanging from the branches. According to National Geographic it is one of the most photographed streets in the United States. As soon as I realized where we were I asked Chris to take a picture of me. After being out and about all day we went back to the bed and breakfast and took a nap. Then showered, changed and met Chris’s brother and his girlfriend for lunch at the Casa Monica. The hotel was absolutely beautiful. I had a whole margarita pizza to myself with a glass of moscato. We signed up for a Bar Crawl Ghost Tour. Our guide took us to four bars and told us ghost stories of past owners while in the bars. I have the bladder of a two year old so I had to break the seal by the second bar. 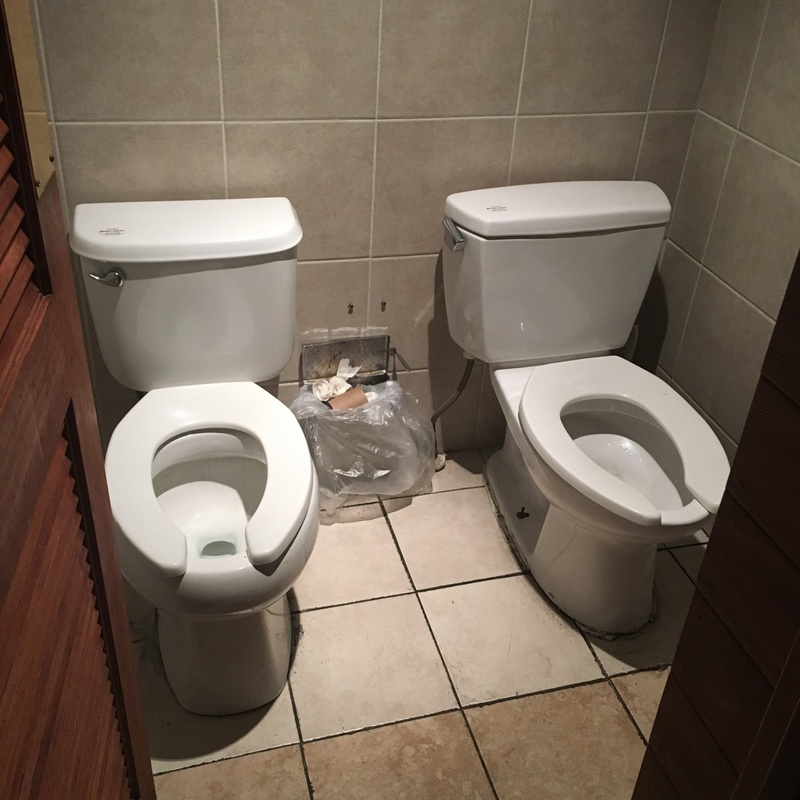 While in the women’s bathroom I encountered a stall that had two toilets in it. It was so bizarre. Another girl was waiting for a stall to open up and I invited her to join me if it wasn’t awkward. She did. So yeah…that happened. In the same bar the tour guide walked us upstairs and told us a ghost story of a ghost by the name of George Coulee who haunts the second floor. That if the employees who work their don’t acknowledge him when they come up he gets upset and moves things. The following morning I had orange juice for breakfast with a bowl of fruit and strawberry banana pancakes. They were so yummy. 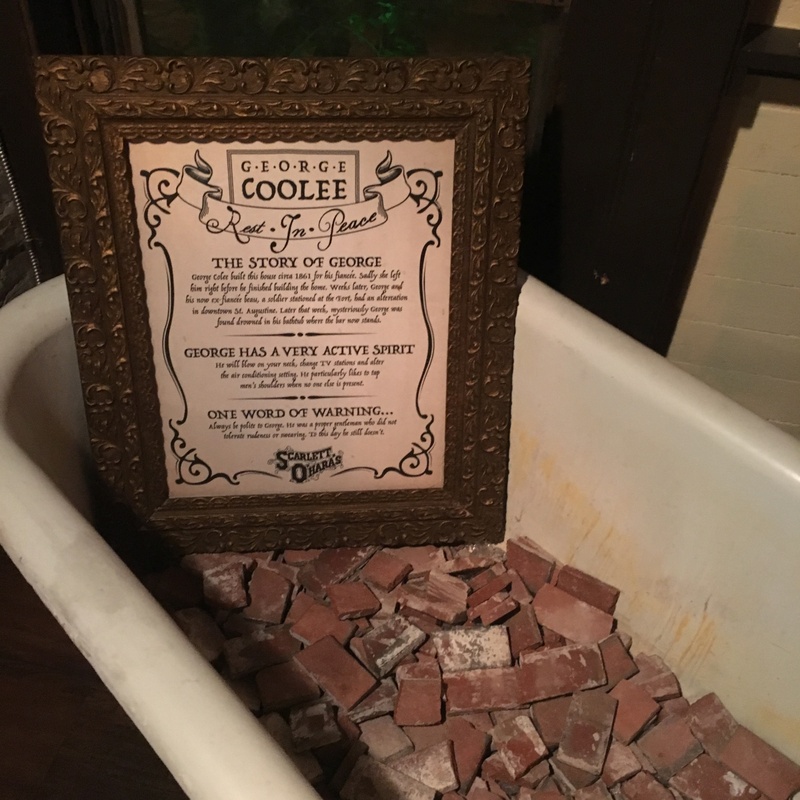 They definitely hit the spot after a night of drinking on the ghost tour bar crawl. It was bittersweet saying goodbye to everyone that worked at the Bed & Breakfast they were all so sweet. I felt like I was saying goodbye to family. 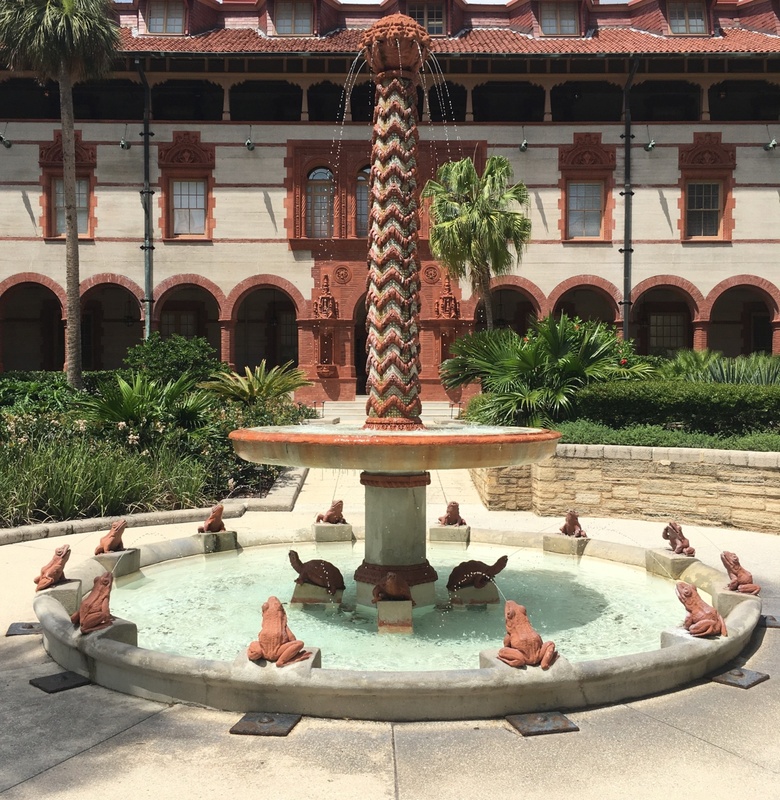 What was once the exclusive Ponce De Leon Hotel is now Flagler College, a liberal arts school. I took a tour of Flagler College and it was absolutely beautiful. The tour cost $10.00 and took about an hour. Rose a current student, a sophomore was the tour guide. She gave us a tour of the lobby, the outside courtyard, the cafeteria, and the women’s lounge. It was built in 1888 by Henry M. Flagler a millionaire developer and standard oil co-founder. You can see three themes amoung the architecture religious, nautical, and Spanish. The cafeteria has Tiffany stained glass windows, theres nothing else like it in the rest of the world. 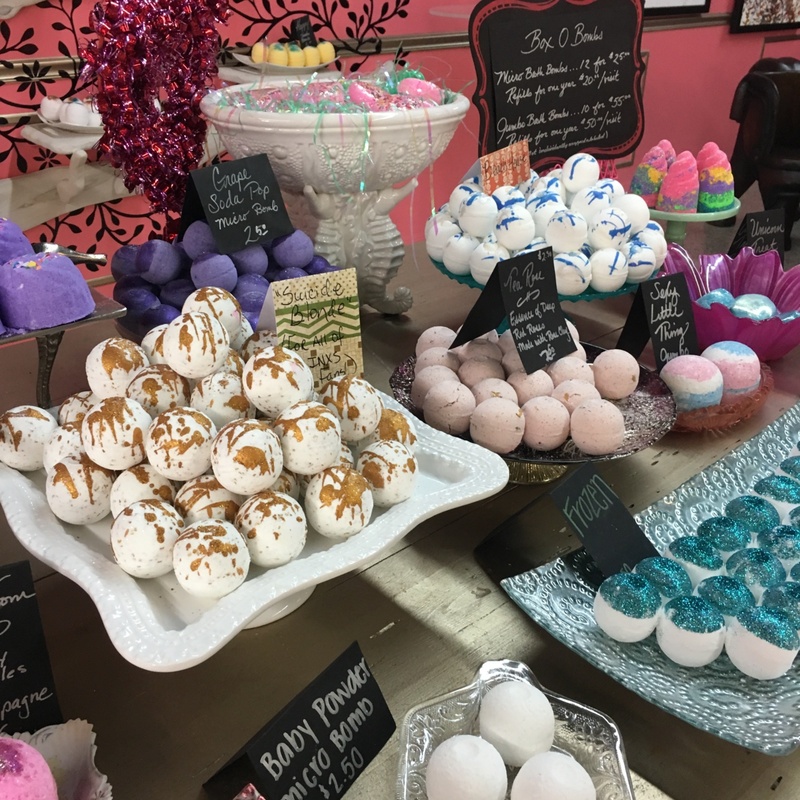 As I was on my way to the St. Augustine Distillery I came across this cute boutique that had all sorts of soaps and bath bombs, it was called Antoinette’s Bathhouse. This boutique was completely decked out. The decor made me want to redecorate my house. Everything was so cute down the the chairs that were more like thrones fit for a queen, the heads peices hangings from the walls and the soaps themselves were decor. I couldn’t help myself and ended up buying three soaps for myself. I bought “Rosemary Mint”, “Coco Natural”, and “50 Shades of Grey”. The “50 Shades of Grey” is for men but it smelled so good, why not. They make all the soaps and bath bombs on site and if you are local you can order online. 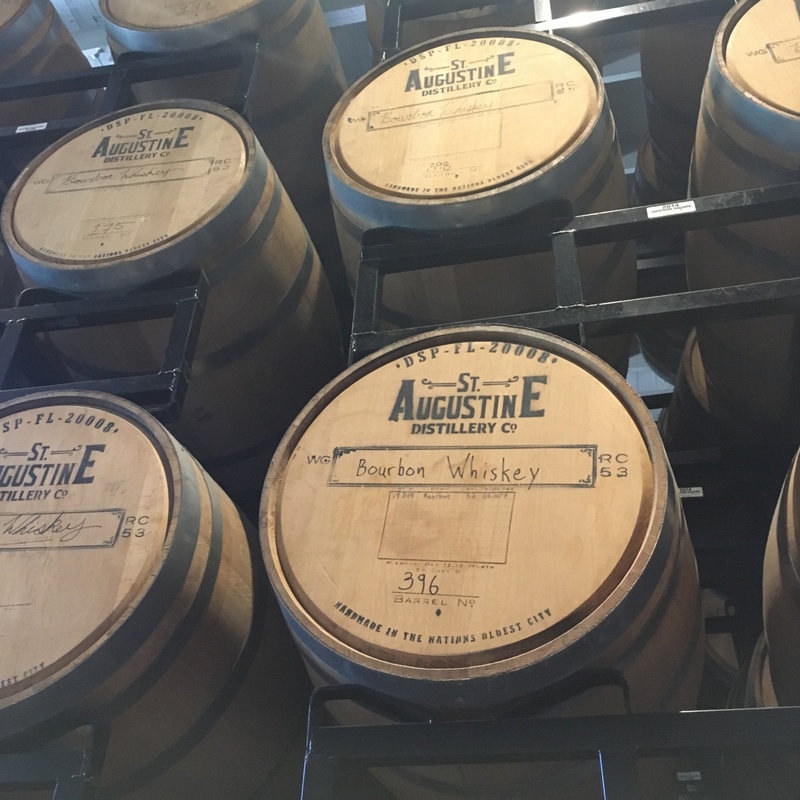 I took a tour of the St. Augustine Distillery, which was FREE and lasted about an hour. When I arrived I was 30 minutes early for the next tour. So I ended up having lunch at the restaurant they had above the gift shop. I ordered a smoked fish dip with old bay kettle chips and pickles. Yum! The tour guide walked us into the brewery and showed us how they brewed everything. Even down to packing the barrels. It was really interesting. After the tour he made us two drinks that we could sample in small shot glasses. Then he referred us to another guide that showed us how to make two more drinks in the gift shop. He also gave us samples in small shot glasses. I ended up buying a cute bottle opener that said St Augustine Distillery on it. I checked out a few more shops before heading back south. If you are a history buff I would highly recommend it. I had the most amazing time in St Augustine. I also vlogged the weekend for my YouTube channel. You can check it out in the video below.